Some 5 years ago I was watching an episode of The Food Network’s Iron Chef and the chefs started using some high tech gear to create dishes that were far from your average Julia Child cookery. Instead, the dishes were shaped in manners that were illogical, almost impossible, and downright weird. Welcome to the world of Molecular Gastronomy. I could devote an entire posting or two to this subject, but today’s post is not about me – it is about two extraordinary individuals, Steven Long, the head chef at The Kitchen Table and Jeff Morgan, the head wine maker of Covenant Wines. As I posted earlier, the event started at 7 PM promptly. We all arrived at 7 PM, and as the proverb states; the early bird gets the worm, was as true as day, as we had the pick of the tables. The first obvious thing to hit you upon seating was the wait staff. Are you kidding me! There must have been 14 wait staff for some 40 or so guests! We were waited on ALL night like royalty. I can remember only once throughout the entire evening, when I raised my hand and there was not a scrum of staff in front of our table. The other aspect that hits you was the mood. The mood was set by the wonderful wait staff, the wine and food enthusiastic guests, while the Pièce de résistance was the dulcet tones and musical abilities of Hot Kugel! Hot Kugel is a San Francisco Bay area Klezmer ensemble. Their music is a blend of traditional Klezmer with the musical styles of old time jazz, ethnic folk, theater and American popular music, as well as blues, rock and reggae. Both Suska and Mordecai were playing a mixture of instruments and music that were both wonderful to listen to and wonderful to have in the background, in the nicest way. The beauty of a well executed offensive play in football always leads back to the offensive line, the unsung heroes, that go unnoticed, unless they make a penalty, and then all you hear is boos. When you are at a fine dining experience you want to enjoy the time with friends, family, and new acquaintances, while still being stimulated and entertained. That is exactly what Hot Kugel delivered. When I wanted to tune them in and listen, I was impressed and highly entertained, and when I was talking to my friends, they never imposed; instead they just lifted the atmosphere as a whole. On an aside, when I was listening and tuning in, I could not help but be mesmerized by Suska’s voice that really did not sound like a voice, but rather an instrument. The varied instruments, music abilities, along with music sensibility, and song choices truly did add to the already wonderful mood. On our table was a basket of, what I can only guess to be, freshly baked beer and rosemary dinner rolls, along with a bowl of lovely olive oil to dip them in. They were quite a treat and a boon for me, as I had not eaten anything since the morning. I listened well to my mother, who always told me (many times), do not fill up on the challah, there is much more food on its way. Sure enough, almost immediate after satiating my immediate appetite, Mr. Long and his staff came out to serve the very first dish – the Amuse Bouche. The first thing I noticed was that Mr. Long had changed his chef’s jacket, from when we saw him walking around before the dish was served, this was something he did throughout the night. When asked by a guest, at the end of the evening, about the apparent attempt to channel Nicole Richie’s dress code (same day by the way! ), Mr. Long was partly shocked and unready with a response, however Mr. Morgan stepped in and stated that he needed to keep a clean look, and it is pretty busy back there. In either case, the first dish hit our tables, and the Amuse Bouche looked interesting, to say the least. The term Amuse Bouche loosely translated means amuse your mouth or palate. The dish came served on a platter of Chinese Soup spoons, for the entire table. 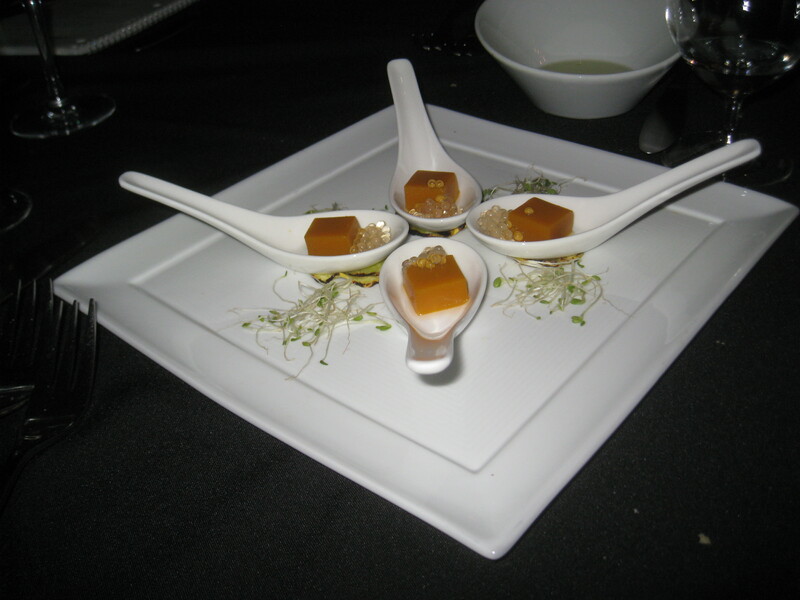 Each soup spoon held what Mr. Long called Hot Roast Squash Gel Cube with Apple Caviar. This was the first of many examples of Molecular Gastronomy that Mr. Long would showcase during the evening and most definitely his weakest attempt. I do not want to get on my soap box about the ideals of Molecular Gastronomy, however, throughout the night there would be hits and misses, and some were clear strikeouts. This was one of them, the idea behind Molecular Gastronomy is simple, in the words of Grant Achatz, the head chef at Alinea where he daily melds technology and Haute Cuisine, “The technology allows us to get to the essence of food, it allows you to be more true with flavor, not less true.” We are supposed to feel the food, taste its raw essence, without all the trappings and machinations of Thomas Keller and his French Laundry restaurant. In this dish, Mr. Long succeeded in losing the trappings, but missed on extracting the essence and feel of the dish. The hot roast squash gel cube had nice flavors, with clear sign posts leading to roasted squash, but the road ended rather abruptly. The Apple caviar, felt more like an early warning system for “all things molecular” coming your way, without actually showcasing the apples or helping to tie the two flavors together. What was missing was a bit of salt to balance the flavors, instead, we had a shot of sweet and a shot of bland apples and not much else. To be honest, I told my table mates, who did not care for the dish much more than I did, that I really hope that this is not harbinger for what else is to come tonight. And to that I scream loud and clear – Heck NO! It was an aberration and one I am sure that maybe we did not get, but let it be clear from my pen to your eyes; the evening held many wonderful surprises and this was the one and only real miss. 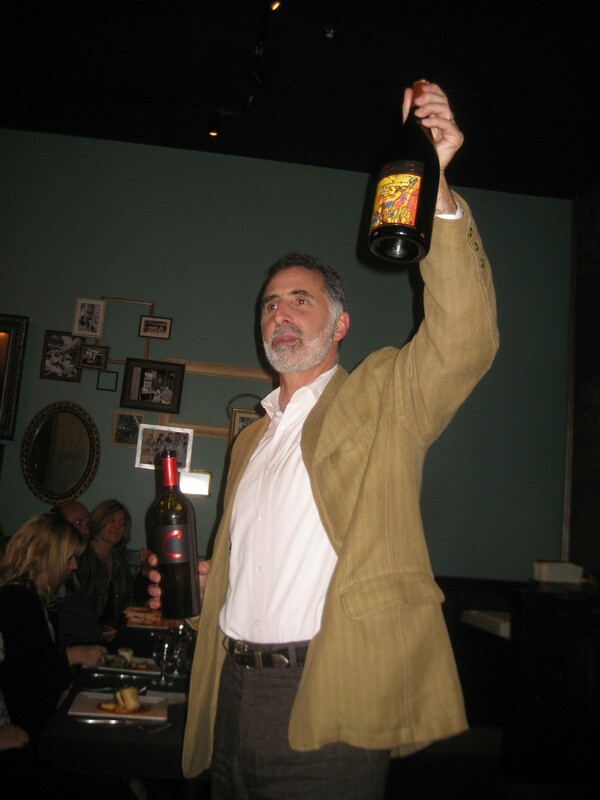 Around the same time as the Amuse Bouche was being passed out, Jonathan Hajdu, the associate wine maker and on-site kosher supervisor was pouring out the first of the four wines that we would be tasting this evening; the 2008 Covenant Lavan Chardonnay. When I tasted it earlier this year at the 2010 Herzog Food and Wine Festival in Oxnard, it actually showed more ripe fruit and tannin – from the oak. It was still young then and crazy fun. Now when we tasted it, the wine seems to be hitting its stride. The tannin is gone or covered over with a blanket of toasty rich oak and butterscotch, along with a bit of fruit. Clearly this is a bottle that is ready to party and one that really was not meant to pair with the Amuse Bouche, but heck it was there so we tasted it. Again, the gel cube barely survived the oak attack, while the poor apple caviar was gutted from the inside out, never had a chance. Again to be fair, it was not a real pairing, but we tried for the fun of it. Today I went to lunch with my two of my friends to the “The Kitchen Table Restaurant: Artisanal Kosher Cuisine“, and the three of us (who are self proclaimed foodies), loved the stuff. It is located on a great street (Castro) in downtown Mountain View, with tons of room outside and in. 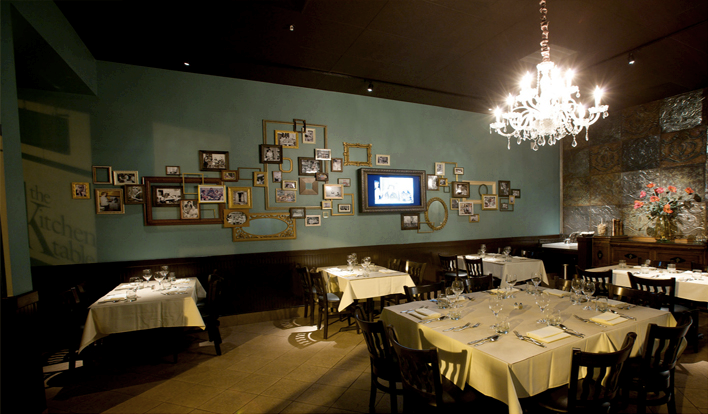 The outside seating is street side, and the inside motif is homey with pictures of families on the wall along with a few nice chandeliers hanging, in an attempt to mimic a kitchen or dining room theme. There is a long table in the back for large crowds of people as well, but it pretty much maxes out after 15 or so people, so large team bashes may be better served outside then in. The menu is a fusion of Mediterranean fare, classic kosher recipes, and slow-cooked fare. The menu is packed with items that are stuffed with homemade dried meats that are smoked in house, pickles cured in barrels on site, along with the wicked cool fact that all food served is made fresh. Pitas, cakes, cookies, dried meats, marinated mushrooms, etc. No matter the menu item, it is based upon fresh and homemade ingredients that tantalize the mind and palate at the same time. If that were not enough, all the food is organic and the restaurant is in tune with keeping the food elements local and always fresh. They were quite nice. The Pita chips were homemade toasted Pita cut into wedges. The wedges were quite lovely – with just enough toast, but with enough bread to give you a nice bite. The Black Bean Hummus was rocking, and was emptied quickly. The lamb sausage (pictured below) was quite nice, cooked to perfection. The age on it was not so long, but still enough lamb and dryness to give you a kick along with nice spices. Just an aside, the waitress was super nice, food was served timely – important for lunch, but we were left alone, when we wanted to dig into our food and our conversation. I think the staff understands the table well! They understood when we wanted out next course, and when we wanted to be left alone to talk and schmooze. Well managed! After the starters – we dug into our plates of food. I ordered Grilled Burgers with lettuce, tomato, and onion, on a honey whole wheat roll. The roll was really nice, but the meat was even better, just awesome. The meat was tender yet gave way to the bite/fork – cooked to perfection! Beyond that the fries that came with it, was great. I tried the salami and pastrami and they were quite nicely done! I must stress all of this food is kosher and made by hand there at the restaurant. Folks, I have lived here long enough to realize that this is the best kosher place we have ever had, or at least as good as the long gone Rafael’s (that was in Berkeley). So, I will be coming back often – that is for sure! Also, this may be a kosher restaurant, but that does not mean that my review is weighted towards that – I would give this score to a non kosher restaurant as well. I have been to this place with folks (from my office) who are not Jewish, and they raved about this place as well. The place has it all, great wait staff, great food, and cool ambiance, so go on over and enjoy. I know I will be going back often, and I hope to be posting more updates as I take in all the goodness. Smokin’! (Wood Smoked BBQ) is Smokin Good!! This past evening saw us driving south through the pouring rain to LA. The rain is great for California, but it is horrible to drive through. Once we got through the rain showers, we hopped off I5 and jumped on the CA-170 for a short trek, before we got off it and quickly found Craig Winchell’s restaurant – Smokin’!. Once we entered the restaurant, I went straight for the counter to get Craig’s attention – one of my old friends from California. Craig owned Gan Eden Winery, until he had to close it, because there were no good options for Jewish education in the Sebastopol area. It was a shame, because the winery produced some of the best Cabernet Sauvignon wines in the 80s and early 90s, along with his famous Black Muscat wines. Remember that Gan Eden was one of the early kosher wineries along with Hagafen (the earliest American kosher winery), and Herzog Winery. So after talking a bit and discussing what we should taste, we agreed that we will try a bit of everything. So we washed our hands and sat down to enjoy a wonderful world of barbecued meats. We need to stress that barbecuing is NOT grilling. Say barbeque to people and they really think about what is called grilling. Grilling is cooking by direct heat, where the flames touch the food. Barbecuing is cooking via indirect heat, and mostly via smoke, but not always. Smokin is a restaurant that cooks all its food by indirect heat, uses smoke from wood, a rub, and a basting to cook the food and keep it moist. The meal started with smoked turkey breast, which is not a cut of meat that one would normally associate with slow, low, and long cooking. But the meat was far from dry and exploding with flavor. To steal a colloquialism – it was finger licking good, which was a theme throughout the meal. The breast meat was sliced a quarter inch thick, and was moist in the mouth, yet still firm to the fork. It was served with a white sauce that Craig calls Alabama White Sauce. The sauce adds a very nice pungent aroma and a mouth that is packed with flavor, and a nice amount of heat, that is still balanced by the sauce’s vinegar and sugar. Next we were served some smoked chicken. It comes in quarter, half, and whole sizes. We had half a chicken and both the dark and white meat were moist and quite tasty. The skin on the chicken was crunchy, while the meat was moist and tender. The chicken’s flavor profile was infused with a smoky flavor that was accentuated by the rub that was placed liberally all over the skin. The spicy rub did not overpower the chicken flavor, but still added enough punch to the dish, quite nice. We were next served the best part of the meal by far – Smokin’! signature dish – barbecued ribs. The ribs were these huge hunks of meat that almost laughed at your sensibilities and formality, screaming at you to grab them and eat up. Well, who am I to argue with a slab of ribs. We happily ate them all up, and what a joy they were. The ribs were encased in this rub that almost extruded from the ribs. The rub was crispy and crunchy, while the meat inside was crazy moist, almost – too moist. I have never had such an experience with meat before. I have had crispy steaks and soft and extra moist meat — brisket and braised meats. But the combination of a crunchy and crispy exterior whose inside was moist and yet firm, is more than I can explain. The flavor of the rub again melded perfectly with the rib’s meaty flavor and was once again accentuated by the smoke’s tanginess. They were quite a treat, the rub flavor explodes in your mouth first, followed by a backbone of meat and highlighted by a bright smoky flavor. The whole flavor profile is off the charts, and well worth the trip to LA by itself. After that, almost anything would be a letdown. Well, we were not let down too much. The next dish was a Smoked “Pastrami” cut. The meat was not brisket (which is normally the meat that pastrami is made from), but rather plate that was cut like pastrami. The meat was a bit fatty and the flavor was more muted than the other cuts of meat we had up to that moment, but it was nice. The rub did not permeate through the meat as much, but it was still OK. The next course was barbequed brisket. If there was a letdown, this one was it. It was a bit too dry for me, which was a shame, as I have long wanted to try to smoke a whole brisket for some time. This course turned me off of that idea, unless it was done by someone with a bit more experience than I. That said, the flavors were nice, but the whole package was off. The final meat course was Barbequed lamb breast – WOW! I am not a fan of the intense lamb flavor, but the meat was moist and intense with flavors that boggled my mind. The lamb flavors melded nicely with the rub flavors and the intense smokiness. If I could get past the intense lamb flavor I would have eaten the whole lamb breast. If you like lamb, this is for you, no questions asked. We finished the evening with a nice slice of sweet potato pie. It hit the spot quite nicely. The pie’s crust was firm and yet moist. The pie filling had a clear sweet potato flavor that was spotted with flavors of cinnamon, allspice, and clean bright acidity. The pie was quite nice, and it was a great compliment to all the spicy flavors up to that point. We hung around until closing and met many of Smokin’! patrons and were sad to leave Craig, but the night called and we had a long drive ahead of us still. I hope that if you are in the LA or Burbank area, that you look up this wonderful establishment and get some of its smokin’ hot entrees. This week I am in Jerusalem and we visited a restaurant called Noya. It is in the area of Jerusalem that is starting to look like downtown Chicago – always under construction. Jerusalem is adding a new light rail system that will run from the City Center to the main bus station. However, it is over budget, still in construction, and it is turning the center of town into a huge mess. Jaffa street, is the main drag in the center of town and it has been turned into a one way street with basically only buses running in that lane. The rest of the road is dug up and waiting for rails to be laid down – but from what I hear on the street, this will be going on for a couple of years still – what a mess. The once proud road of Jaffa that goes through the city and ends at the Jaffa gate – is now in ruins. The once bustling and litter strewn streets are now littered with closed shops and ditches that are untouched. So now the center of town, where the entire buzz exists, is actually a few hundred feet after the construction zone (and more towards the old city) – called Shlomtzion Hamalka. Along with the new mall that starts right after the Shlomtzion Hamalka district, and that runs all the way up to the old Jaffa gate, called Mamilla Mall. Anyway, Noya is right on the corner of Shlomtzion Hamalka – on what Jaffa turns into right after the construction zone. The restaurant has a nice ambiance and the service is competent and charming. I wish I could say the same for the food. We started off with two appetizers – the lamb platter and the Beef Carpaccio. The lamb platter was OK, but underwhelming in flavor and slightly overcooked. The Carpaccio was more pickling than beef. The vinegar and lemon overpowered the dish, which is a shame, as the meat looked nice. The theme of the restaurant seems to be lamb, as the menu for the entrees is dominated by lamb dishes and a few fowl dishes. There was one beef dish; Entrecote, so we decided on the entrecote and the mixed lamb platter. To pair the meat dishes we had a bottle of Galil Shiraz/Cabernet Sauvignon 2005 blend. The wine was nice, but the lamb again was underwhelming. The Entrecote was nice and cooked perfectly. The salad that accompanied it was pretty to look at and to eat. The lamb platter however, was again overcooked and lacking in punch or flavor. Lamb dishes should allow the lamb to talk for itself. The tangy and gamey flavors should mingle with the dish’s overall direction. Unfortunately, our dishes were more listless than tangy and the overall dish lacked motif or even imagination. Again, the entrecote, was delightful and well put together, I guess it was a bad day for the lamb dishes, and would try the restaurant again. The nose of this red and purple haloed wine has a pair of lives. It starts with an inky Shiraz nose of cassis and sweet wood. Later the nose changes to a cabernet nose of pencil shavings, sweet wood, cassis, cranberry, and raspberry. The mouth of this full bodied wine is soft with Cabernet stylings – which make sense as the blend is 51% Shiraz and 49% Cabernet. The mouth has cassis and raspberry. The mid palate has eucalyptus, some acidity, and slight to integrated tannins. The finish is medium long with more wood, nice tannins, and acidity.